Well, the Norris/Banonis team is back again with a 2009 calendar full of classic Jeep photos, and the quality and selection is as good as ever. As with last year's calendar, there are a few flatfenders, a few other Jeeps from the Willys era, and a few more recent examples. But these guys are not coasting on their previous success; this new calendar has a sophistication of design and a richness of content that will keep you happy during all those times when you can't get online and browse CJ3B.info. On the cover of the calendar they advertise the extra features as "U Auto Know" Facts & Photos, and I did learn some things I didn't know, by looking at the many sidebars and special dates included in the calendar. There is stuff here to mull over and enjoy during all those hours sitting at your desk wondering how to start a letter, or standing in front of the workbench wondering how to start a repair. The CJ-3B in this year's publication is the fire engine owned by Northstar Willys. It has been featured on CJ3B.info, but you'll want to see this photo of the Jeep in action in front of an actual burning building. There are also several really nice station wagons this year, but for me a couple of standout pages are probably Gary Keating's M170 ambulance, and Pete Dunkel's factory-loaded CJ-5. 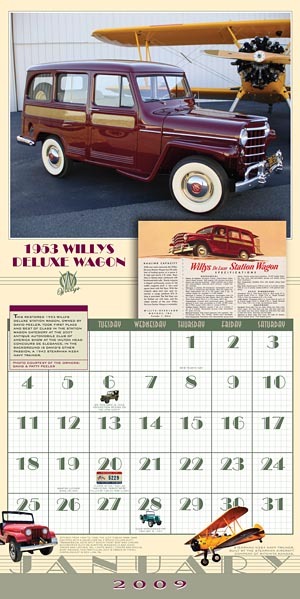 The Jeep Classics Calendar has progressed in just a couple of years from being a nice glossy set of photos to hang on your wall, to being one of the sharpest looking and most interesting calendars you're going to find on the market on any topic. And something you're going to want to save as a reference book at the end of the year. It's available online, but it's not available outside North America due to the licensing by Chrysler.